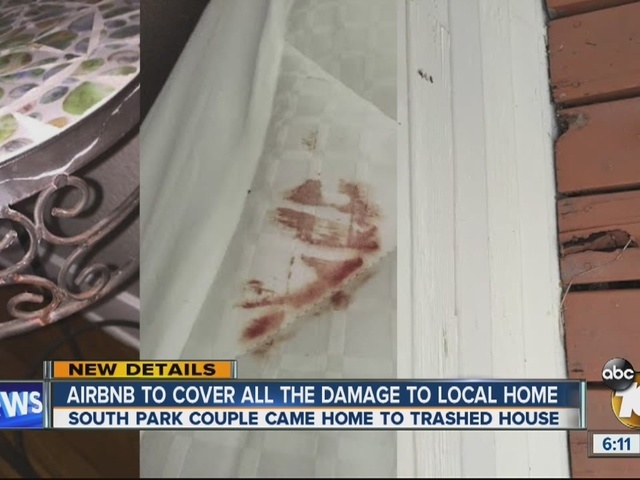 UPDATE: Airbnb has agreed to cover $20,000 in damages following what happened to this family's home. 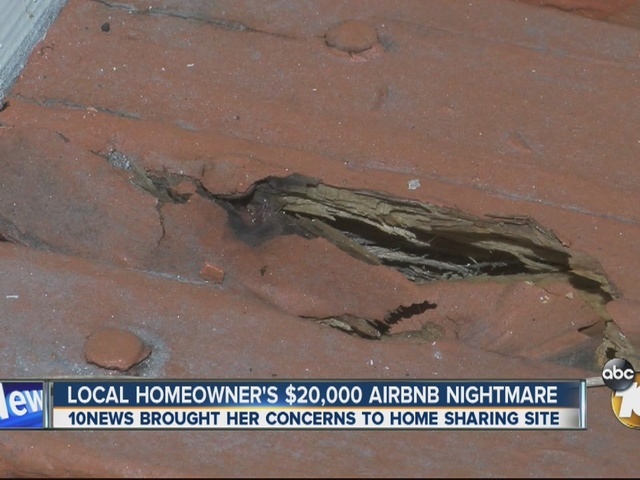 SAN DIEGO -- A local couple says their decision to rent their home on Airbnb has turned into a "homeowner's worst nightmare." Photos show the damage -- from a bloodstained mattress pad and a ripped screen door, to an oil-stained cushion and burns in cabinets and lampshades. "I don't know how else to describe it. It's a sickening and helpless feeling," said Megan Duma. Two weekends ago, she and her husband rented out the home she recently purchased for a weekend on the popular home-sharing website. "… I've used them for five years, so I felt comfortable," said Duma. As she was relaxing on vacation in Canada, she got a call from a neighbor. "You find out while the party is going on that your home is being trashed and you feel so helpless," said Duma. She called police, but the damage was done. Neighbors had heard a loud fight, leaving behind a bloody mess and trashed home to the tune of $20,000 in damage. "Your mind starts to race … Have I lost my baby's photos? Have I lost my wedding photos?" said Duma. Those weren't damaged, but the same can't be said for the frame of a Peter Lik print -- a wedding gift from her husband -- or a series of broken tiles and wine glasses. On her backdoor deck, there are many damaged wooden planks because someone lifted them with a crowbar to retrieve a dropped cellphone. When Duma contacted Airbnb, she said she was met with confusion over coverage and technical issues with filing a claim. "They warned me certain things aren't covered so don't get your hopes up," said Duma. Duma claims Airbnb's exclusion of some "fine art" may not protect her damaged items. She showed 10News an email informing her cleaning and property management expenses wouldn't be covered. "It adds insult to injury; I may not be paid back for the damages I've suffered," said Duma. On Tuesday afternoon, 10News contacted Airbnb with Duma's concerns, and soon after Duma received an email informing her the company will be covering cleaning and property management expenses.